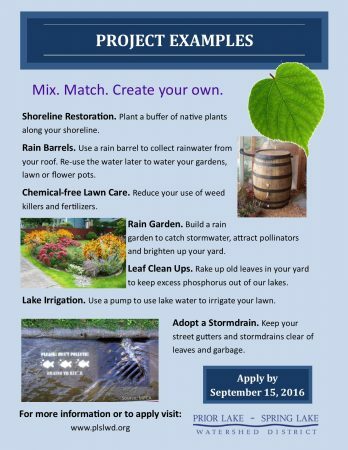 The Citizen’s Advisory Committee (CAC) of the Prior Lake-Spring Lake Watershed District is once again sponsoring a contest to inspire citizens to value, conserve and protect our freshwater resources. Projects completed within the last several years which provide water quality benefits are eligible for the Water Quality Improvement Award. Many types of projects qualify, see the award application for more details. The project must be within the boundary of the Prior Lake-Spring Lake Watershed District and have been completed in 2015 or later. Finalists will be recognized and up to four applicants will be selected as award winners and each winner will receive a $500 cash prize. Certain projects, such as rain gardens, shoreline restorations and use of lake water for irrigation may be eligible for cost share funding. Please see our Cost Share page for more information. The application deadline for the 3rd Annual Water Quality Improvement Award is October 19, 2018. The 2017 Water Quality Improvement Award was awarded to four families, with one other family receiving an Honorable Mention. Each of these families installed best management practices like raingardens or shoreline buffers to improve water quality on their property. The 2017 Award winners were: Christian Morkeberg; Cindy Sellin; Jim Lally; and Eric Zastrow. Christian Morkeberg combined a raingarden with a shoreline restoration, that together reduce runoff to Spring Lake (Photo is of Morkeberg’s restoration project). 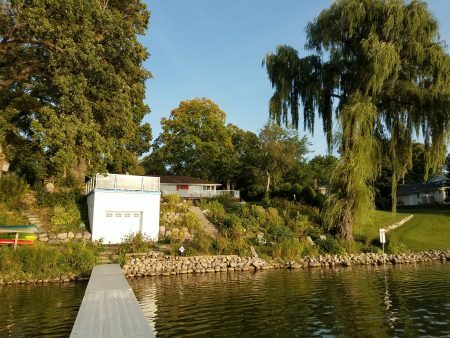 Cindy Sellin installed a filter strip on her shoreline that slows runoff and prevents contaminants such as sediments, organic matter, nutrients and pathogens from running into Lower Prior Lake. Jim Lally (nominated by another homeowner) installed a raingarden that reduces stormwater runoff to Spring Lake. Eric Zastrow (nominated by another homeowner) installed a raingarden on the East Side of Willow Beach Association property, which reduces the runoff and sediment running into Upper Prior Lake. Honorable Mention: James and Candace Freemon installed a raingarden to catch stormwater runoff that was causing mud and erosion on a hilly and densely shaded corner of their property.